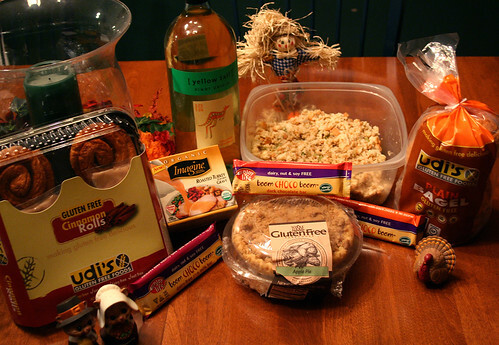 My third Gluten and Dairy free Thanksgiving was a success. My Mom is the Thanksgiving Goddess so I mostly leave it up to her but I try to have plenty of extras on hand since I usually stay with my parents for a couple of days. I took Wednesday off from work to go down and help Mom prepare. She basically makes all the traditional fare, turkey, stuffing, mashed potatoes, squash, green beans, corn, gravy. Apple and pumpkin pies for dessert. She's good about modifying some things for me but in general, it's up to me to make sure I have things to eat. My favorite parts of Turkey Day are the stuffing, gravy and apple pie. She made the gravy with cornstarch so that I could have it and it was sooooo good. I used Udi's bread, onions, celery, garlic, chicken stock and Bell's seasoning. It didn't come out exactly as I'd hoped. It was a little dry and crumbly, I prefer a more cakey texture like the original. When it came time to serve it up, I ended up mixing an egg with some water, mixing it into the stuffing and cooking it longer. This definitely helped. I will definitely modify this recipe next year to see if I can get it just right. For as long as I can remember I've been helping my mom to bake the apple pie from a Betty Crocker recipe from her old school, orange 3 ring binder cookbook. 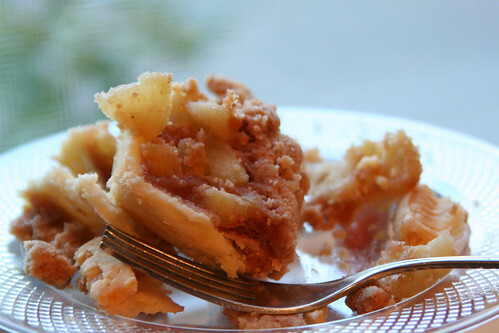 It's a basic, traditional apple pie recipe. I could use a gf pie crust and make it the same way but this year I ran out of time. I bought a Whole Foods GF Bakehouse apple pie. It's not dairy free but that's ok. It was delicious. I have a lot to be thankful for and this Thanksgiving was awesome as always. The most important part - the family. I am very lucky to have such an awesome family!! Lots more family events coming up in December and of course Christmas is now only a month away! More posts to come, Happy Holidays everyone!! Bell's Seasoning isn't GF anymore. I emailed them a couple of weeks ago, and they replied that it is now made in a facility that also manufactures wheat and they cannot certify its GF status any longer. You're Baaaacccckkkk!!!! Happy belated Thanksgiving Jen! 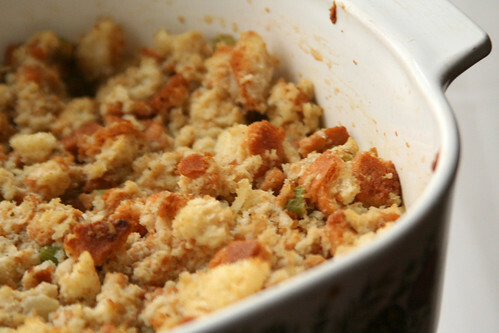 I used to LOVE Stove Top stuffing too and I recreated it a couple of years ago (we call it "Faux-Top Stuffing" LOL!). The best bread to use is actually Ener-G's Light Tapioca Loaf, ya know, that funny "bubble wrap" bread? :-D It will give you that moist cakey texture you are looking for (I've tried it with all the new GF sandwich breads, like Udi's and Canyon Bakehouse but when you add moisture to the dry croutons, it just breaks down to crumbly texture (have no idea why). For this reason, I have continued to use Ener-G for all my stuffing needs.